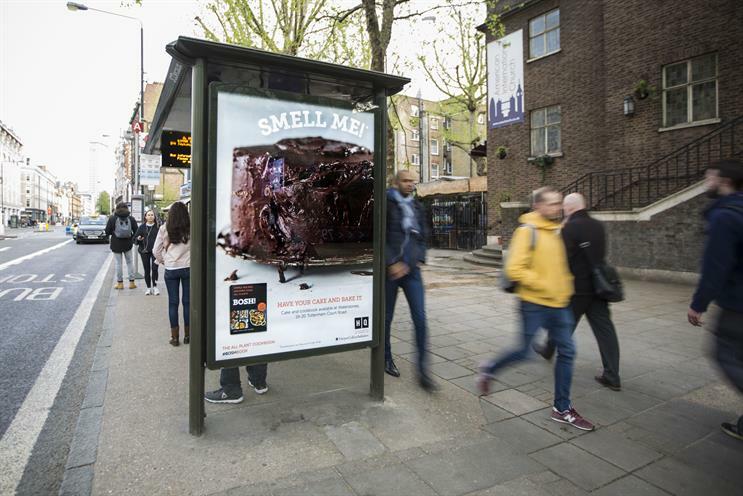 HarperCollins, the publishing house, has installed a scented bus shelter to launch a vegan book. The activation on Tottenham Court Road is designed to promote the first cookbook from online vegan cooking duo Bosh!. It aims to "appeal to people at their ‘point of hunger’ during their commute home". HarperCollins is using a "science-led" strategy that draws on a biological response when people are presented with the sight and smell of food that they enjoy. The work was devised and planned by MediaCom’s TED division, and produced in-house. Joanna Rose, HarperCollins HQ marketing director, said: "With vegan, vegetarian and flexitarian eating so rapidly on the rise, we knew that we needed a standout campaign for a breakout book. "Targeting consumers at the ‘point of hunger’ with mouth-watering digital advertising, and creating an event advert that looks so good you can actually smell it, has perfectly combined the fresh, creative and tempting content of the book with a campaign that will tickle the taste buds (vegan or not) of our target audience."